Retirement and investment plans are frequently secondary concerns for divorce property division. What to do with children, the house, cars, and spousal support are the first things that come to people’s minds as soon as they hear the word ‘divorce’. Retirement and investment plans, however, are sometimes the largest assets that a husband or wife have when they begin divorce proceedings. There is a tendency to think of retirement and investment plans as immune from divorce proceedings. This is because the person working has been the one building and growing those plans, but this is not the case. A court divides assets in retirement and investment plans between spouses just like any other piece of property. Houston divorce attorney John K. Grubb offers the expertise and experience you need to make the best decision about your plans. He can explain how Texas courts divide investments and retirement plans and how it affects you. Are Investment and Retirement Plans Community Property in Texas? Most of the time, yes. Texas is a community property state. This means that a Texas family law court will consider all property acquired during marriage as community property. In a divorce, the court has the discretion to divide all community property. This includes 401(k) plans, 403(b) plans, IRA’S, pension plans, and employee stock option plans that were acquired, contributed to, or that increased in value while married. Valuing and splitting investment and retirement plans often complicate a divorce. First, you need to differentiate defined contribution plans, defined benefit plans and investment plans. A Houston property division attorney can help you distinguish the types of retirement plans and act accordingly. However, we included basic definitions below for your ease of use. Defined contribution plans are those to which you, your employer, or both of you contribute a set amount each year. The benefits that defined contribution plans pay out depend upon the amount that goes into your account and the earnings on the investments in the plan. Examples of such plans include Individual Retirement Accounts (IRAs), 401(k)’s and 403(b) plans. On the other hand, under defined benefit plans employers promise to pay you a certain amount of money based on a formula. An example of this is a pension plan. In the private sector, usually only the employer contributes money to the pension plan. The pension plan then pays the employee a set amount upon retirement based on factors such as past earnings, length of service and age at retirement. Investment plans are generally plans people set up with various financial institutions such as banks, credit unions, brokerage firms, etc. They receive funds with after tax dollars. You can usually liquidate the assets on short notice and then convert them into cash. If your divorce involves any type of 401k, 403b, or pension that is to be divided, in addition to the Final Decree of Divorce, then it is necessary to have the Court sign a QDRO. This will address how to divide the retirement asset. Once the Court signs the QDRO, it must then be served upon the Plan Administrator. The Plan Administrator will then review the QDRO to make certain that it does not require the Plan to do anything contrary to the underlying Plan documents. The Plan Administrator has a “reasonable” time to accept or reject the QDRO. This usually ranges from 60 to 90 days. Once the Plan Administrator accepts the QDRO, then the Plan Administrator will divide the retirement benefits into two separate accounts. This will include one for the employee (the Participant) and one for the spouse (the Alternate Payee). The Plan Administrator will notify the Participant, the Alternate Payee and the attorneys when a QDRO is accepted. As the Alternate Payee, What Should I Do with the Plan? Depending upon the Plan, the Alternate Payee may leave the funds on deposit with the Plan, may roll the account over to an IRA, or may withdraw the funds (and pay the tax for withdrawing the funds). Each Plan is different, usually consisting of several hundred pages of a trust agreement. If the Plan Administrator thinks that the QDRO requires the Plan to do something not permitted by the Plan, then the Plan Administrator will reject the QDRO. He or she will specify how it needs to change in order to comply with the Plan. If a Plan Administrator rejects the QDRO, the Court will then have to enter a revised QDRO. Once in a while, a Plan Administrator will be kind enough to prequalify a QDRO or provide form QDRO’s. If the Plan is well-administered plan with diverse investments, then the Alternate Payee often elects to leave the funds in the Plan. If the Plan is a small plan or is all invested in the company stock (remember Enron), then the Alternate Payee should probably seek the services of a financial advisor about transferring the assets to an IRA Rollover. Questions About Divorce Property Division? 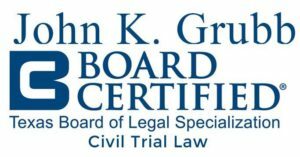 John K. Grubb is a high asset divorce attorney. He is board certified in Civil Trial Law by the Texas Board of Legal Specialization. He also has an MBA in finance and accounting, which can be very useful to you. For more information about handling retirement and investment plans in divorce, speak with our Houston divorce attorneys.